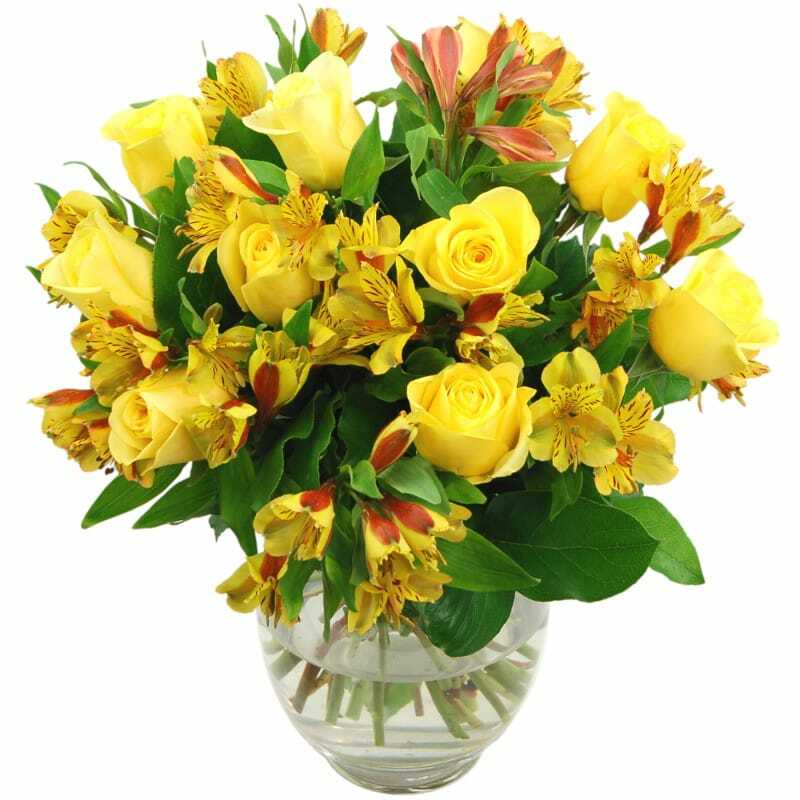 There's a welcoming feel to this wonderful bouquet of warm yellow roses and delicate alstroemerias. The soft feel and rich friendly colours make it incredibly appealing. Quite simply, it's the kind of bouquet of flowers which you always wish that somebody would buy for you! So make that wish come true - either by indulging in a Yellow Rosmeria Bouquet bouquet for yourself, or by ordering one for someone you know who has a love for flowers. The Yellow Rosmeria Bouquet will appeal to all kinds of flower lovers - with its alluring scent and vibrant colours, it makes a great dinner party gift or message of congratulations. This cheery Yellow Rosmeria Bouquet - straight to your door! For just £34.99, this joyous and warm bouquet comes graced with luscious green leaves and carefully hand-tied by our expert florists; ready to be placed straight into a vase to light up any setting around the house or the office.The Yellow Rosmeria Bouquet can be delivered 7 days a week and qualifies for next-day free standard flower delivery to any address in the UK. When you order your Yellow Rosmeria Bouquet from Clare Florist, you can also take advantage of an array of additional options to make your flower delivery even more thoughtful. Why not adding a tasty box of chocolates - ideal for making the ultimate romantic statement! Another great option is our selection of tasteful handwritten cards - you choose the message to accompany your bouquet, meaning that even when you order flowers online, you can still make every bit as personal as if you were handing them over in person. And if you love the Yellow Rosmeria bouquet, have a look at the rest of our lovely new Rosmeria range, including the Rosemeria Red, Rosmeria White and Rosmeria Peach bouquets, all featuring gorgeous rose and alstroemeria arrangements.